A disturbed man suffering from apparent mental issues told police he had an explosive that was rigged to blow them all away. 27-year-old Rashaun Washington of Camden was disoriented and refused to follow orders when he engaged in a 28-minute standoff with police. Washington ultimately charged officers and was shot despite their warnings and attempts to talk him down. The incident began Saturday when officers responded to a call for a suspicious man on Wood Street and Northwest Boulevard. Witnesses described Washington as behaving erratically and refusing to follow commands from officers. Investigators say Washington told officers he had an explosive device wrapped in a T-shirt he was holding. In the footage, an officer could be heard asking, "How big is that thing going to blow up then? How big is that going to blow?" 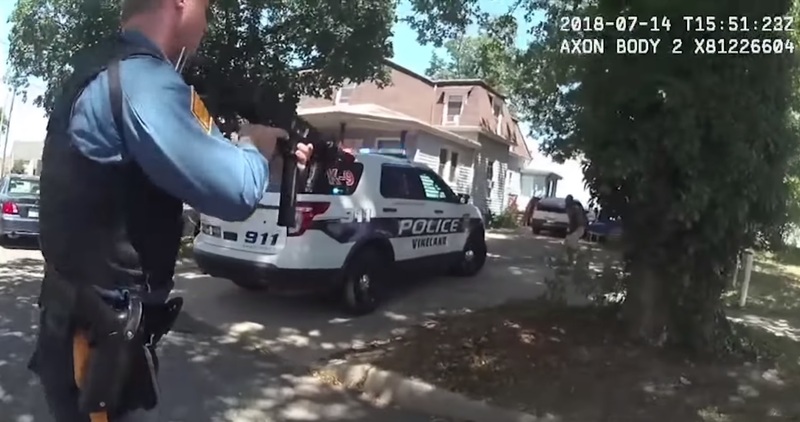 Washington refused repeated demands to drop what he was holding and after nearly 30 minutes he finally charged toward officers who fired their weapons. Officers are also seen using a K-9 unit and numerous bottles of pepper spray on Washington. Washington's family and friends marched on the Vineland Police headquarters in protest of the shooting which was clearly justified. A family member said, "I'm no expert, but from what I saw, he was somebody who was someone who needed help and that's not what he received." The fault lies with no one but Washington who can be heard in the video begging for officers to shoot him in the head. He also threatened to set off an explosive that would take them all out. Washington's mother said, "I want that man to be charged, just like any other human being. They did not have to kill him." The Cumberland County Prosecutor's Office said the investigation is still ongoing. @contrarian: yeah, that's what i was wondering. let the doggie have some fun. but, it ended well anway. If his family cared so much, why did they let Rashaun-wacky-firstname act like a nutter? Dass my babby. What he do?